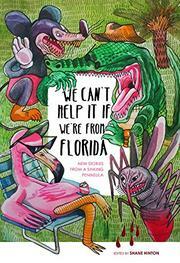 Contemporary authors consider what it really means to be from Florida in this new anthology edited by Hinton (Pinkies, 2015). A sinkhole opens up inside a cheap motel room ("Major Dissociation on Crescent Lake," by Jeff Parker). A woman ponders the seduction of Florida lightning in the context of her experiences with electroconvulsive therapy ("Lightning: An Essay in Flashes," by Amy Parker). A lonely retired loan officer explores the awkward universe opened up by online dating ("All Right, Now, Cupid," by Sohrab Homi Fracis). A mannequin takes the place of a wife—or maybe she is the wife ("Dummy Up," by Kristen Arnett)? In this collection of disparate stories, essays, and poems, there are a few themes, in addition to geography, that link things together. Loss, displacement, an impending sense of threat and danger—these are perhaps hallmarks of most of contemporary fiction—but there is also a certain ambivalence, a certain craving for that darkness, that the introduction at least would have us believe is specific to Florida. In a state where the weather and the wildlife have a better than average chance of killing you, maybe the awareness of mortality makes life just a little more precious, even when it’s still ragged around the edges. The protagonists, fictional and non, are often battered, lost, and struggling, but they fiercely hold on to their senses of self and to their senses of, and longing for, place. Most of the authors in the collection have impressive bios, and very few of them still live in Florida. This seems noteworthy because, in the literature of Florida, one of the most important elements seems to be the desire to leave—and the realization that one can never truly disassociate from these deep Southern roots. Florida may be gothic, depressed, on the verge of being swallowed up by the ocean—but for some, it’s still home. A heartfelt, complex counter to all those #FloridaMan jokes.